a book by Nicola Hanefeld. Foreward by Stefan Ball, director of the Bach Centre. The author relates in thirty-nine autobiographical stories how the remedies have played a role in her life. She shares her experiences with readers while she looks back in honest and authentic tales based on entries from her personal journals. The stories are sometimes touching and sad, sometimes strange and sometimes wry and funny. Each chapter closes with a passage on recognising the remedy states and botanical notes on the plants. In addition, the book is illustrated by photographs of all the remedy flowers by the author. Readers comments. Price outside Germany: € 26.70 including postage and packaging, VAT free. Details of how to pay. 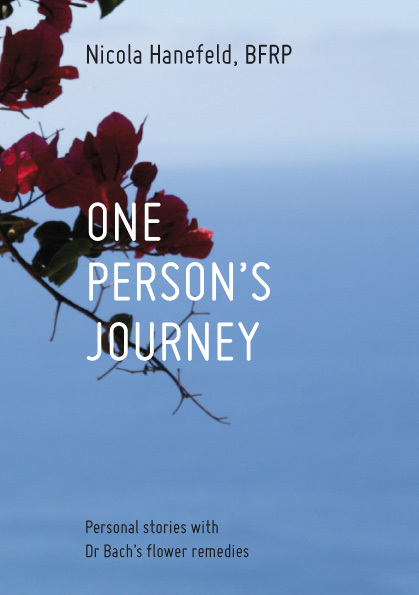 View the first 30 pages of One Person's Journey as an e-book with the "look inside" function. In contrast, an occupational hazard threatens people who write more formally about the remedies. It occurs when we focus so hard on the system, on remedy indications and dosage and so on, that we forget to put any people in. This is especially strange because the whole focus of Edward Bach's work was people – their personalities, their feelings, their emotions. Humanity is central to the remedies. That, in a nutshell, is why this book is special. More than a book about remedies, this is a book about people. Using her own life and experiences as a framework, Nicola Hanefeld introduces us to those fundamental feelings and personalities that are the basis of Dr Bach's system. She tells us about her life, her faults, her qualities, her relationships. The stories are human, sometimes wry, always engaging. Some will move you; some – I'm thinking about the tale of how Nicola came to own a Cerato plant – are gentle and funny. The decorating story made this reader laugh out loud. This book teaches the remedies because it's all about life. That's putting things in the right order. On the same evening I met the plant yet again in the garden of the house where I was spending the night in Oxford. I suddenly spotted a low growing small Cerato plant and commented on it to my surprised hostess. As she had only brought it and planted it on the previous day she could not understand that I had even noticed it. 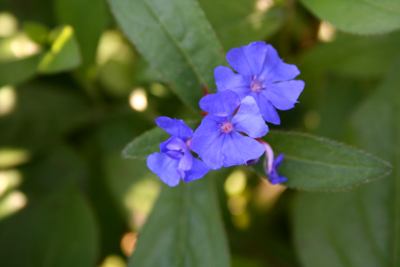 The brilliant sky-blue flowers in the late summer light had captivated my attention. I explained why the plant was special to me and also told her that the elegant Cerato is Tibetan-endemic. A couple of days later, being not far from Sotwell I took a trip the the Bach Centre and – you´ve guessed already - Cerato was there yet again, this time hardly surprising at Dr. Bach´s home. In September, back in Germany, I knew now that I had to have my own personal Cerato plant - but where to find one? Journeying around garden centres did not appeal to me, above all without knowing before hand if they even had it in stock. I need not have worried; as I went shopping at my local supermarket for the first time following my return, my eyes fell on a small, solitary (and decidedly feeble looking) Cerato plant on the floor upon entering the supermarket. It was labelled an “Autumn special offer” and was priced at 2,22 Euros. I stood there a little bemused. Then smiling, I bought it and left quickly. Back home I had a good chat with the plant and gave it some of the rescue remedy. Within 3 days I was rewarded by dozens of the electric blue flowers vivid against leaves now tinged red.Autumn was approaching. Since then I have kept Cerato on my balcony and make it a habit to take it now and again to support my own listening to that quite inner voice, always remembering the strange series of events that led me to getting acquainted with the plant. Watch a photo-story video with photos from the book. 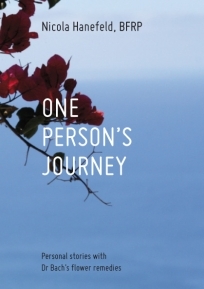 Nicola handled tells story about her new book "One person's journey" with photos of bach flowers. "I am impressed by the courage and clarity shown by Nicola as she writes about her own journey through life with the flower remedies. When reading it, you are drawn in to compare the stories and experiences with your own journey of learning and growth and this gives us a deeper understanding of the remedies and their relevance to our own lives too. I have loved reading this book. It made me smile and tore at my heart too. The book has something to offer to everyone – practitioners as well as people who know little or nothing about the remedies. It is about life – a life lived." "I almost cried while reading 'Danke Joris', very well written. In general I actually think it’s a very useful book. Pictures, anecdotes, botanical notes and a quick reference table in the back, what else could one wish for." "I really found the book compelling reading - very insightful and I recognised many states in it (particularly having an immovable view or opinion!) it flows really well - it's modest too but very descriptive in terms of your emotions." "This book has such an interesting concept. Starting with the names you have so aptly selected for each chapter. I love the pictures and the idea of writing botanical details for each flower and when & how Dr Bach added each one of the 38 remedies. Each chapter is so touching! As I read, I go through my own experiences and so many situations when I could have used the Bach remedies as near and dear ones suffered and I could do 'nothing' ... I have read many books on BFRs but this one is special." Since I have received your book I have not let it go! It is incredibly written, interesting and exciting. I have found an even deeper respect towards each flower and can remember them now much better. Your confidence and your biography touch me very much and your honesty gives me a lot for my own personal development. I'm on page 187 and save a story for each day." "Uff ... gähn… schon wieder ein Bachblütenbuch. Aber ich beginne zu lesen und es packt mich. Obwohl ich nur Schul-Englisch kann, weine und lache ich, ein Gefühlscocktail wie ihn nur die Bachblüten bereitstellen, erfasst mich: Fallgeschichten und botanische Einblicke für den Intellekt, Emotionen und schöne Fotos fürs Gemüt und eine spannende Biographie. Wunderschön, ehrlich und unterhaltsam! Man darf in das Leben eines Bachblüten-Menschen (auf gut Neudeutsch: Practitioner) hineinschauen. Danke - ein schönes Buch!" "Wie auch schon in den Seminaren bewundere ich Nicolas treffsichere Art, die typische Charakteristik einer Blüte zu beschreiben. Das Buch ist mit einer erfrischenden Offenheit und großer Authentizität geschrieben. In „Speedy Gonzales“ und anderen Kapiteln erkannte ich einerseits Aspekte von mir wieder (was mich bisweilen zum Lachen brachte), andererseits wurde mir auch bewusst, dass ich bei mir selbst für manche Blüten „betriebsblind“ war – ist meine häufige Schlüsselsuche nicht auch ein bisschen Clematis? Tatsächlich hat mich das Buch sehr motiviert, selbst wieder regelmäßiger die Blütenessenzen zu nehmen (statt nur in extremen Krisenzeiten). Als Apothekerin freue ich mich auch über die botanischen Details der einzelnen Pflanzen und die wunderschönen Fotos machen Lust, in der Umgebung nach Bachblütenpflanzen zu suchen. Ein sehr gelungenes Werk, welches ich sicher immer mal wieder in die Hand nehmen werde." "Nicola provides an invaluable opportunity through her personal stories for us to get closer to the Bach flower remedies and in knowing them more, we can also learn more about ourselves. In addition, Nicola is also a gifted botanist and photographer with a keen eye for detail. In this book she has collected botanical notes about Dr Bach’s plants complemented with her fabulous photos. She has woven her personal and professional stories in such an engaging and informative way and made the links to the remedies and the botanical details. It feels very authentic." was born in 1958 in London and graduated from Reading University with a combined Honours degree in Botany and Zoology in 1979. She is a teacher of the Alexander Technique and has been a Bach Foundation Registered Practitioner (BFRP) since 1997. Nicola lives in south-west Germany and is mother of 3 children. She has enjoyed doing semi-professional photography for over 30 years and has kept a journal on her life since she was 14. These journals were used as the basis for the stories in this book. Product Dimensions: 8 x 5 x 0,8 inches / 21 x 15 x 2 cm. Shipping Weight: 23 ounces / 650 g.
Printed by Printsystem, Heimsheim, Germany.